How to operation: 1.Taking out of devices connect with TV via the HDMI port and the 5V 1A charger and plug into the outlet. 2.Select HDMI chanel, now the G2(device name) connecting menu appeared on the screen.if you use iphone pls choose Airplay,if you use android phone pls choose miracast on the screen by using button onthe side. 3.Open the wifi of your iphone, choose the SSID and enter the password which says on the screen. 4.Open the browser and enter the URL which is "Step 2" on the screen, select the Wifi and connect with your home wifi. for iOS:5. Open the Airplay, select the device name and mirroring. 5. Select the mirroring screen display, then select our device SSID and connect, and wait for a few seconds. After connected, now you can use it . Stable Signal: Wifi Display Dongle: Screen mirroring adapter for tv. External Antenna 10m Wifi Signal Will Provide More Stable Wireless Than Other Devices(Wi-Fi: 802.11b / g / n 2.4GHz ). Adapter for Streaming Video, Web Surfing, Photo Viewer, Live Camera Sharing, Media Player. Almost no delay!You life will be easy! No APP Installation: Do Not Need To Install Ezcast, Ezcast Pro Or Jianlian And Other APP To Support Wifi Display.Just plug and play, and with a switching button, you could switch Airplay mode or Miracast mode easily. Only 3 steps to enjoy the media on large screen: Plug->Connect->Mirroring. 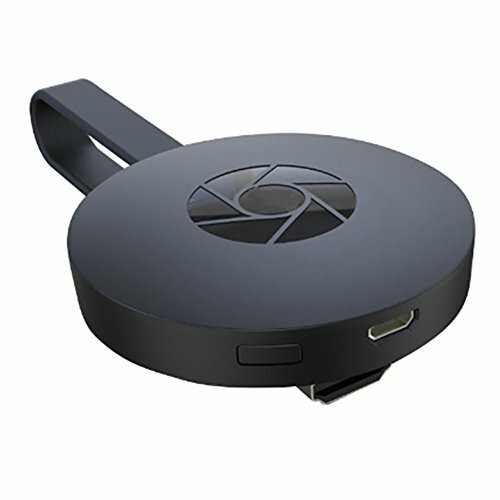 High-Definition Image: Miracast dongle for tv Support 1080P, you can connect PC, smartphone or iPad to TV or Projector,supporting Online & Local content wireless display: Video / Audio / Photo / Office file / Website And etc. Game Screen sharing. Wonderful experiences. Notes : 1.Please Read The user manual or Contact with our service team first if you do not know how to use.It is important. 2. Keep Power Source(5V1A) Connecting When Using 3. please check your phone if it is compatible.